Cerebral palsy (CP) is a nonprogressive disorder of the developing brain characterized by the disturbance in movement and posture, causing activity limitation and is often accompanied by disturbances of sensation, cognition, communication and behavior problems, epilepsy, and secondary musculoskeletal problems. Differential diagnosis of CP includes glutaric aciduria type 1 (GA-1), arginase deficiency, juvenile neuronal ceroid lipofuscinosis, juvenile metachromatic leukodystrophy, Lesch–Nyhan syndrome, mitochondrial disorders, Niemann–Pick disease type C, Pelizaeus–Merzbacher disease, and Rett syndrome. It is a common practice that these disorders maybe misdiagnosed as CP if not presented with classical symptoms. Microcephaly is rarely reported with GA-1 in literature. 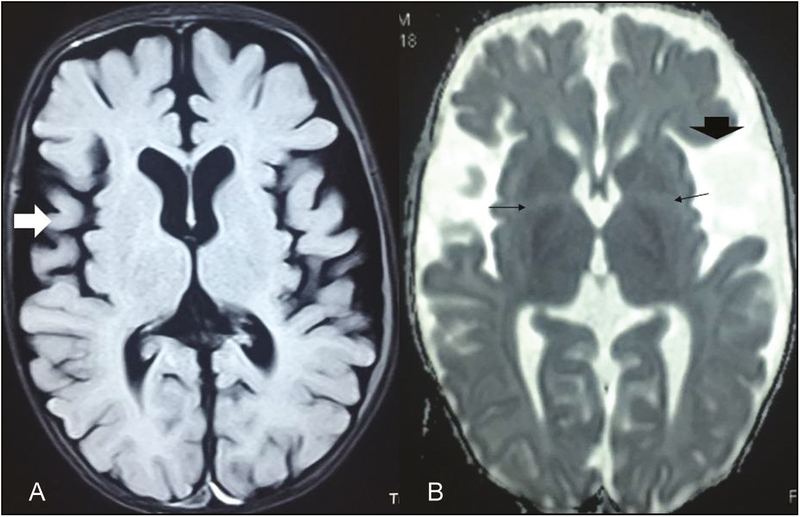 Here we present a case, who was diagnosed and treated as spastic CP because of spasticity and microcephaly, presented in emergency department with acute-onset neuroregression and extrapyramidal symptoms following a short febrile illness and later on diagnosed as a case of GA-1. A written informed consent to publish the case report was obtained from the parents. A 13-month-old boy was born to non-consanguineous parents with a previous history of perinatal asphyxia and hypoxic ischemic encephalopathy. He was born by normal vaginal delivery at 38 weeks of gestation with normal antenatal period. He did not cry immediately after birth and APGAR (Appearance, Pulse, Grimace, Activity, Respiration) score was 3 at 5min and 6 at 10min after birth. His weight and head circumference at birth was 3kg and 33.8cm, respectively. The neonatal screening for common metabolic disorders was not performed. He had developmental delay that was noted since early infancy. His current developmental age was around 4 months. He also had progressive spasticity that was noted since 6 months of age. At 8 months of age, he was shown to a local pediatrician and diagnosed as a case of spastic CP and started on physiotherapy and oral baclofen tablet. Compliance was poor for physiotherapy. At 12 months of age, he had an acute viral illness that was characterized by fever, cough, and irritability. After the illness, he lost all previously acquired milestones and developed intermittent twisting of limbs and arching of body. No history of seizures was reported apart from the neonatal period. On examination, he had stunting and wasting (both length and weight were below the fifth percentile), microcephaly (head circumference was 43cm [Z score of less than 3]), bilateral spasticity, hyperreflexia, and generalized dystonia. The magnetic resonance imaging of brain revealed widened Sylvian fissure, hyperintensities in bilateral globus pallidus, and bilateral frontoparietal atrophy along with white matter loss [Figure 1]. The urine examination by gas chromatography–mass spectroscopy (GC-MS) revealed a marked excretion of glutaric acid and 3-hydroxyglutaric acid. Genetic test revealed homozygous mutation in GCDH gene and both parents were carrier for the same. The diagnosis of GA-1 was confirmed on the basis of characteristic neuroimaging, biochemical, and genetic studies. The child was started on trihexyphenidyl, l-carnitine, and high dose riboflavin (100mg/day). Dietary therapy in form of low-protein diet with lysine and tryptophan restriction was advised to the parents. CP is a common physical disability of childhood. Various metabolic and genetic disorders may be misdiagnosed as CP if they presented with atypical symptoms. Some of these disorders are slowly progressive and have more probability of misdiagnosing as CP if seen by inexperienced pediatrician. Individual prevalence of these disorders may be low, but as a group they are in significant number. Some of these disorders may be treatable and it is important that these disorders are correctly diagnosed early in the course of the disease so that the treatment can be started as soon as possible. Genetic counseling and prenatal testing should be offered to the family as some of the conditions are inherited. GA is one of the condition, which is misdiagnosed as CP, particularly dyskinetic CP. GA-1 is an autosomal-recessive disorder of lysine, l-hydroxylysine, and l-tryptophan metabolism. This inborn error of metabolism is caused by the deficiency of the mitochondrial enzyme glutaryl-CoA dehydrogenase (GCDH), which catalyzes the dehydrogenation–decarboxylation of glutaric acid, an intermediary metabolite in the degradation pathway of lysine, hydroxylysine, and tryptophan. The GCDH gene on chromosome 19 has been implicated in the causation of GA-1. GA-1 has a wide range of symptoms. Macrocephaly is a prominent feature and presents in 75% of patients during infancy. If untreated, approximately 90% of patients will develop neurological symptoms during 3–36 months of age. Microcephaly is rarely reported with GA-1. The microcephaly in our patients was presumably because of severe cerebral atrophy with advanced stage of disease or maybe attributed to hypoxic brain injury. Muranjan et al. published a case series of four patients with GA-1. In their series, three patients had microcephaly. The second presentation is characterized by acute encephalopathy, seizures, ketoacidosis and vomiting, often precipitated by gastroenteritis, intercurrent febrile illness, immunization, or surgical intervention. If undiagnosed, it becomes rapidly progressive and leads to death. Biochemically, GA-1 is characterized by an accumulation of glutaric acid, 3-hydroxyglutaric acid, glutaconic acid, and glutarylcarnitine. These can be detected in body fluids by GC–MS. The management should aim at early diagnosis of the condition by newborn-screening programs and prevention of acute episodes to minimize the neurologic insult. A low-lysine diet, supplementation with riboflavin and carnitine, and intensified emergency treatment during acute episodes of intercurrent illness should be started. GA-1 is commonly associated with macrocephaly, but in cases of static disorders where worsening of neurological symptoms is present with acute episode of illness, possibilities of GA-1 should be kept in mind. Early diagnosis by prenatal screening and prompt initiation of treatment is desirable for limiting the neurologic insult to children. Rosenbaum P, Paneth N, Leviton A, Goldstein M, Bax M, Damiano D, et al. A report: the definition and classification of cerebral palsy April 2006. Dev Med Child Neurol Suppl 2007;13:8-14. Krigger KW. Cerebral palsy: an overview. Am Fam Physician 2006;13:91-100. Hoffmann GF, Athanassopoulos S, Burlina AB, Duran M, de Klerk JB, Lehnert W, et al. Clinical course, early diagnosis, treatment, and prevention of disease in glutaryl-CoA dehydrogenase deficiency. Neuropediatrics 1996;13: 115-23. Heringer J, Boy SP, Ensenauer R, Assmann B, Zschocke J, Harting I, et al. Use of guidelines improves the neurological outcome in glutaric aciduria type I. Ann Neurol 2010;13: 743-52. Hoffmann GF, Zschocke J. Glutaric aciduria type I: from clinical, biochemical and molecular diversity to successful therapy. J Inherit Metab Dis 1999;13:381-91. Bjugstad KB, Goodman SI, Freed CR. Age at symptom onset predicts severity of motor impairment and clinical outcome of glutaric acidemia type 1. J Pediatr 2000;13:681-6. Kölker S, Koeller DM, Okun JG, Hoffmann GF. Pathomechanisms of neurodegeneration in glutaryl-CoA dehydrogenase deficiency. Ann Neurol 2004;13:7-12. Muranjan MN, Kantharia V, Bavdekar SB, Ursekar M. Glutaric aciduria type 1. Indian Pediatr 2001;13: 1148-54. Kölker S, Christensen E, Leonard JV, Greenberg CR, Boneh A, Burlina AB, et al. Diagnosis and management of glutaric aciduria type I—revised recommendations. J Inherit Metab Dis 2011;13:677-94.